I loved this book, the only problem I had with it is that when I read it around my family members and laughed out loud, they looked at me as if I lost it. Pfft. Seriously though, this book is hilarious and inspiring at the very same time. Ellen is such a kind hearted person and you can tell that she is more than a comedian through her writing. She loves her wife and her life and is at a happy place and most people strive to accomplish that. "Happiness is a journey, not a destination." 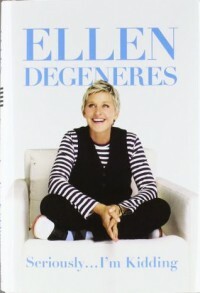 Ellen takes us through her journey to become who she is now through comedy and satire. She highlights some serious topics as well, she believes in honesty and hard-work. "You have the power to change your own mind-set so that all the negative, horrible thoughts that try to invade your psyche are replaced with happy, positive thoughts." which is true, happiness is a state of mind and you get to control your own mood. It doesn't depend on anyone but yourself. This was a truly inspiring read and I recommend it to everyone.